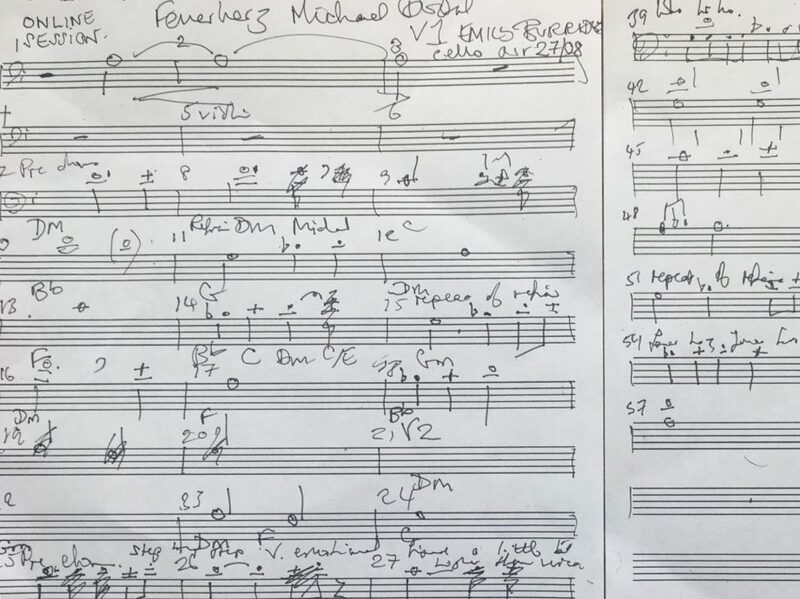 September 2018 Michael Dostal international recording session and request for cello part to be written. “Working with Emily was an absolute dream. We went from first contact to completing the project in less than a week – which seems to be a real rarity with session musicians nowadays! The most important thing for me on Table For Two was capturing a unique cello performance full of personality & passion rather than editing together ‘perfect’ parts, which was something Emily was able to get spot on first time with her great control of her instrument. The recording quality was fantastic, options of both microphone & DI recording were provided (both were used…obviously!!) and she totally understood what I was after. I really couldn’t be happier with what she came up with – the cello really defines that song now, which is exactly what I was hoping it would do.” “Table for two” . Cello arrangement and online session for Joe Perkins CD release “Double Denim”. In having a cello part created and recorded by Emily – initially please send a mix of your track as an mp3 and indicate where you hear cello part / parts. In sending a notated part for Emily to record the cello please be specific and exact for the different phases of your song, marks of expression and phrasing. Once Emily has listened to your song she can then give you a quote and prior to commencing recording she requests that the fee is transferred to her PayPal account where it is left until you have heard her recording /arrangement and the work is completed. In Emily creating a part please send key changes and indicate verse,chorus and mid 8 sections, Lyrics also help in achieving the right vibe for a song. If you have a notated cello part then please e mail as a .jpg file format. Having recorded the cello part she sends a mix of the cello merged with your track and then you can give feed back – please advise if unable to respond within 24 hours. On completion she transfers the payment from Paypal. Emily Burridge, is a classically trained virtuoso ‘cellist with a talent for improvisation honed to spontaneous perfection by the demands of top flight session work. With more than twenty years experience employed in recording studios either reading the notes or free improvisation Emily is at home within the recording environment as she is on stage performing.Working in many genres of music including; pop, rock, folk, latin, dance music and classical. As well as reading a notated part her perfect pitch enables her to identify chordal structures and establish a ‘cello part. She loves to work alongside producers developing ideas and as a composer in her own right she easily adapts to writing cello and string arrangements. Her professional home studio facility enables her to make high quality recordings of the ‘cello and this facilitates online recording sessions which she commenced in 2014. On line sessions are perfect for international sessions and those on a tight deadline, a limited budget or would just like to ‘hear Emily play’ on your production. Proximity of location is not an issue anymore…! As an artist you make a saving on the cost of travel expenses, studio and engineer time. As long as Emily is available to record the turn around after initial contact is typically within four days.